To lovingly steal a phrase from one of the many people I follow on Twitter, we are now well and truly in the 'bbrrrr' months: Septembbrrrr, Octobbrrr, Novembbrrr, Decembbrrr! With the weather shifting perceptibly cooler and the evenings drawing in, vegetable gardening changes dynamically. Gone are the long days full of light and warmth, replaced by gloom, gloom and grey – especially if you live in London and your 'garden' is a high-rise balcony! Although my tomato plants are doggedly hanging in there, they're definitely wilting and becoming less productive – rather like Gordon Brown really. Despite this, the focus of the London Vegetable Garden has now officially turned to winter vegetable gardening. Along with the continual trays of salad leaves growing on my balcony windowsill (which remains very warm in the sunshine), I have three main batches of 'crops in pots'. One of the key things I've learnt from the London Vegetable Garden project has been that when planting in pots, one needs to sow the seeds thinly, so that roots have enough space. 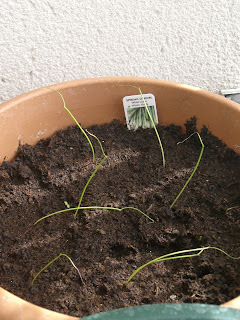 I'm hoping that these thin, grass-like shoots will end up forming into tasty spring onions! 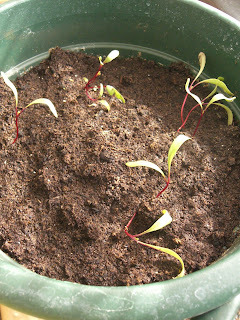 Again, thin planting has been employed but I fully expect that I will have to transplant these once they get a little bigger. Finally, I'm having another stab at growing carrots. 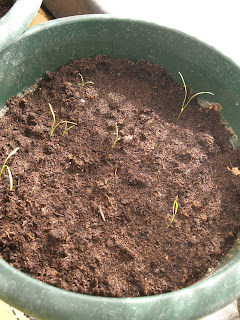 I planted my first batch of carrot seeds way back in April when I started the London Vegetable Garden. My initial enthusiasm got the better of me and it transpired that I had sown far too many seeds in too small a pot for anything of note to grow. As you can see, I really have been frugal with my planting this time round, but I hope that the seven shoots I have will carry more success than the initial attempt! As always, progress will be chronicled here at the London Vegetable Garden blog, as well as on the London Gardeners' Network, which now has well over 100 members! I will miss summer, but I am excitied to start Fall gardening. You are off to a great start! Yes autumn is defo rolling fast and thick. How is the butternut squash doing? September Update: What's Going On?